EGYPTE – Erment - A French archaeological mission from the French Institute for Archaeological Studies have unearthed a yet unidentified royal statue of a New Kingdom king during routine excavations at Monthu Temple, northeast of Karnak Temple in Luxor. The statue is 125 centimetres tall and made of black granite and depicts a standing king wearing short dress with hands aside. Christopher Tiers, head of the archaeological mission, said that early studies of the statue suggest that the artistic features of the depicted king confirm its royalty. Tiers asserted that excavation at the site is in full swing in order to find any additional statues that may enable archaeologists to identify the New Kingdom king. Monthu Temple is dedicated to the worship of the falcon-headed got of war Monthu. 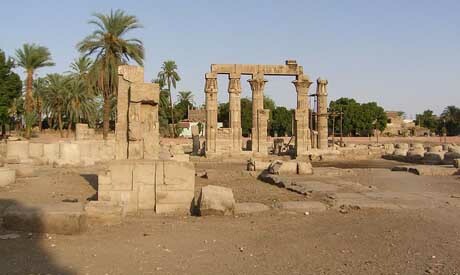 The temple is located five kilometres northeast of Karnak in an area called Armant on Luxor’s east bank. Armant was excavated by French archaeologist Fernand Disson de la Roque from 1925 to the post-war period, when he revealed many buildings, including Monthu Temple. The temple replaced an older sanctuary from the Old Kingdom and consists of an open forum with a tower and enclosing two mounds that housed the chapels of worship. The ruins of the last structure date to the reign of Ptolemy VIII, although decorations and additions continued to be added centuries later by the Romans. Along the span of time, Monthu Temple was a major centre of worshipping Apis bulls, that is why it contains many statues and reliefs of bulls. TURQUIE – Metropolis - A 2,500-year-old statue of a woman from the late Hellenistic period has been unearthed during the excavations at the Metropolis ancient city in İzmir’s Torbalı district. The head of the excavations, Trakya University Archaeology Department Associate Professor Serdar Aynek, said the headless, dressed, female statue was found buried in the city wall and that the statue reflected the richness and magnificence of the late Hellenistic period in its 2-meter length. Aybek said that many statues found around the city walls during the excavations had been sent to the İzmir Museum. ROYAUME UNI – Stronechrubie - Analysis of charcoal at the site of a suspected Bronze Age "sauna" suggests the surrounding area hosted a rich and diverse woodland. Archaeologists have been examining what is called a burnt mound at Stronechrubie, in Assynt. Excavations of the burnt mound - a crescent shaped mound of stones - revealed a metre-deep pit linked to a nearby stream by a channel. The project's archaeologists believe it may have been created for bathing, or as a sauna. Other possible uses for the site included cooking and feasting, or perhaps brewing, but no food or cooking remains have been found so far. Gordon Sleight, projects leader for Historic Assynt, said the charcoal was examined in a lab set up in Stoer Village Hall. He said: "It has been amazing to realise just how much charcoal we dug up, when what we thought we had was mostly sooty stone, and it has been really interesting to use microscopes to see the internal structure of the charcoal and identify the tree species." 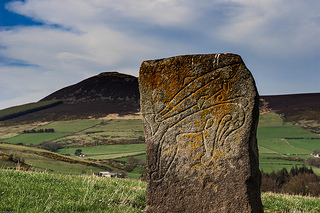 Jack Robertson, of AOC archaeologist, added: "We have identified alder, hazel, birch and one of the hawthorn/apple/pear/quince group of species, and we have also found some interesting heat-affected stones and some possible worked stone." Wood from birch, alder, hazel and hawthorn, or apple, trees has been identified. ROYAUME UNI – Ammanford – More is to be made of Ammanford's castle as a tourist attraction. It is 800 years old, dating back to the 12th century and was built by the Normans as a temporary castle. Mr Norman said: "We need to clear all the over-growth and have information stands put outside. It is a very important site." Mr Madge said: "It is the history of the castle that's important — there are 68 motte and bailey castles in Carmarthenshire." 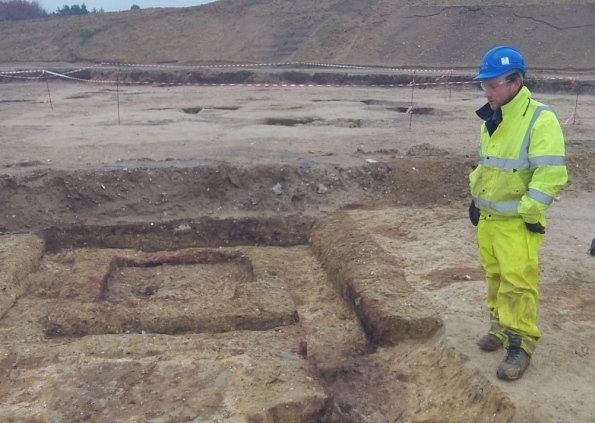 ROYAUME UNI – Bury - Archaeological work on a major road development has revealed artefacts dating back more than 6,000 years. Flint workings, primitive tools and clay ovens are among the finds unearthed on the Elveden Estate during the Highway Agency’s preliminary work to dual the A11. The 20 week survey has taken place on a stretch of land between How Hill Tumulus and Chalk Hall Farm. Evidence of settlements dating back to 1,500BC, including timber dwellings, animal bones and pottery have been found. Oysters, a metal lock and animal bones have also been found on the site. Mr Pankhurst said human remains had been found in one pit, alongside the skeletons of two cows. The grave could be a ritualistic burial, he added. The digs began in August and are due to end next month. 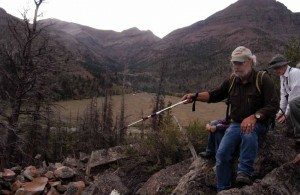 USA – Yellowstone - Todd led about two dozen hikers to a high bluff in the Shoshone Forest overlooking the remote site where Amelia Earhart had started building a cabin to escape the public spotlight before she disappeared while flying over the Pacific Ocean in 1937. The subject of considerable public interest, Earhart’s historic cabin is now being restored. But Todd was more interested in learning about a mysterious hilltop ring of stones and wooden supports first documented in 1969, which he and others have been studying for the last few years. Researchers have speculated that the outpost was used as an ancient fort or hunting blind, but they have had little hard evidence to help date the site or better determine its exact use. The tiny fragments, each smaller than a nickel, offered what Todd said was “strong evidence of prehistoric use” of the site, possibly for hunting or butchering sheep. “Before we got here today, this was a totally enigmatic rock structure,” Todd told the group, beaming with the thrill of a discovery that might seem inconsequential at first blush, but that was deeply important to him. The artifacts found by Simcox are among more than 80,000 cataloged since 2002 by Todd and others working on the Greybull River Sustainable Landscape Ecology project. Though white settlers have frequented the Yellowstone area for only a couple of centuries, indigenous people have moved through and lived in the region for roughly 13,000 years, Todd said. Finding traces of their presence, even tiny items like flakes of obsidian shed when making tools or projectile points, isn’t as hard as it might seem, he said. FRANCE – Vélines - Depuis lundi, l'Inrap pratique des expertises du sous-sol sur les terrains destinés à accueillir l'Écopôle, afin d'évaluer le potentiel archéologique du site. Les sondages sont effectués suivant un plan en quinconce, avec des tranchées espacées de 20 mètres et profondes de 2,50 mètres environ. Les experts considèrent ce secteur du néolithique final (2500 à 2000 avant J.-C.) comme intéressant et susceptible de révéler des restes de poteries et de silex. Cette zone accueillait une population semi-sédentarisée qui découvrait l'élevage et l'agriculture.